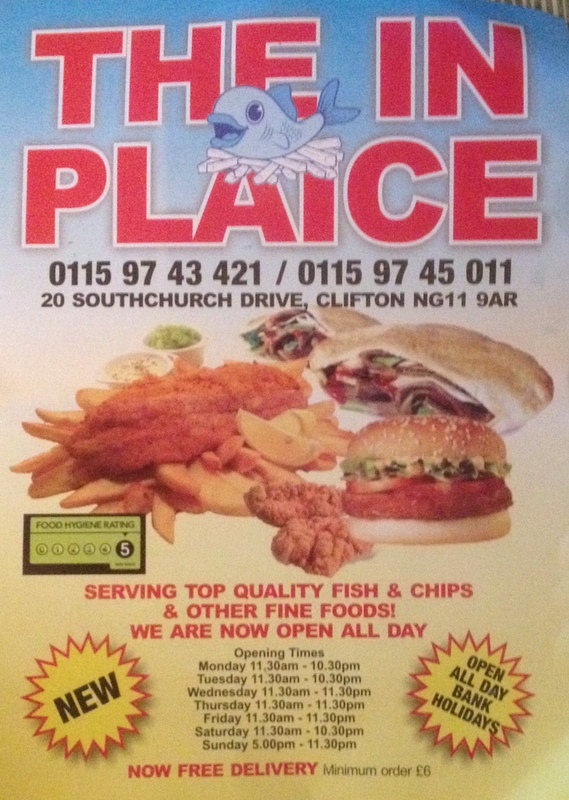 The In Plaice is a Fish and Chip shop (with extras) just next to the Southchurch Drive Tram stop in Clifton on the tram line running between Nottingham Station and Clifton South. The menu is your standard affair, to be honest do you even need a menu when you walk into a Fish and Chip shop? To me its just a question of whether you are having Cod and Chips or Haddock and Chips. If you are one of those people all up in my face about Cod stocks then maybe we are looking at Pollock. I ordered the Haddock with Chips and Mushy Peas and it was a really very decent sized portion indeed. The haddock was a good ruler length and filled up and overlapped my plate at home. The chips? well I could only fit half on the plate, the picture above shows about a third of them. I honestly do not think it was possible for one person to eat a whole portion! I ate most of them in the picture, plus a good handful as I was opening the bag, but even a greedy and hungry man such as me in this moment could not do justice to that which was given to me on this day. The Fish was good, it was sitting waiting for me on the counter, so I suspect the batter could have been crispier, but the Haddock was tasty, had good flavour and gave the impression that it had been cared for. The chips as I said were over-plentiful and was I like them, soft juicy and crispy / solid at the same time. The Mushy peas had a green vibrancy about them, and helped make each mouthful enjoyable. One of the things I really loved was when I asked for it all to be wrapped, the lady wrapped my fish separately as she ‘didn’t want to break it’, I like that care and attention for my food, even when I am having a takeaway, that shows class.